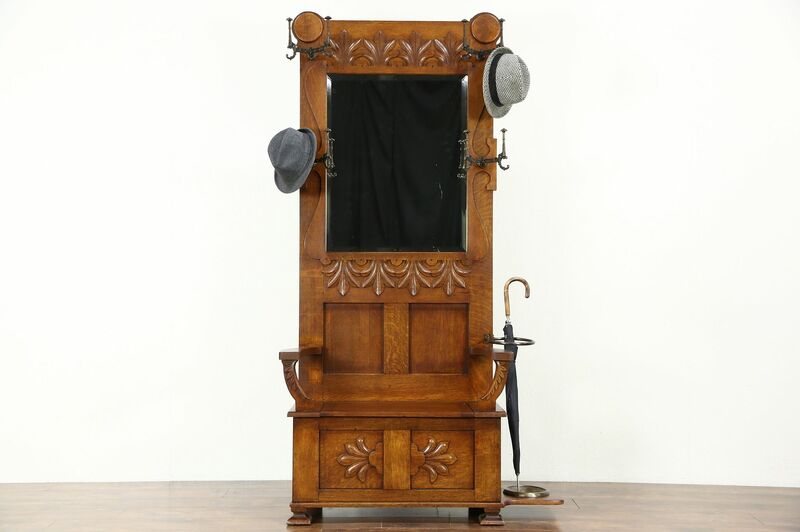 A Victorian period hall stand was carved of solid quarter sawn oak about 1900, and has a lift seat bench with storage below. A cane and umbrella holder has a patinated brass drip pan with a few dings, see photos. Embossed cast iron coat and hat hooks appear original. The restored finish is in excellent condition on this American made hall furniture, which would also be functional in a dressing area. There is a little antique "smoke" in the original beveled mirror to show its age. Measurements are 45" wide including the umbrella holder, 17" deep and 83" tall.